Real life always ends unhappy. That's the frustrated thought of Skeeter (Adam Sandler), who seems unable to fulfil his life-long dream. But on the day it rains bubble gum balls, he realizes that some bedtime stories do come true. Sandler's Christmas cookie with Disney icing. Marty Bronson (Jonathan Pryce) is a single father and manages his own small motel with lifeblood, but very little economical sense. That is why he is forced to sell to Barry Nottingham (Richard Griffiths), who light-mindedly promises to make Marty's son general manager, when he is grown up and has proven himself accordingly. Many years later Marty's daughter Wendy (Courtney Cox) rears her two children Patrick (Jonathan Morgan Heit) and Bobbi (Laura Ann Kesling) responsibly on her own. Marty's son Skeeter (Adam Sandler) still works as a janitor in the ritzy hotel which Nottingham threw up on the premises of Marty's motel. Skeeter is a general servant, but unlikely as it seems, he still dreams of becoming the manager. When Nottingham announces a brand-new gigantic hotel project, Skeeter believes that his time has come, but once again he gets overlooked. Nottingham promises his future son-in-law, base Kendall (Guy Pierce), to be manager, shattering Skeeter's dream. At the same time Skeeter's sister, who is a school director, has to leave town for a job interview, so she asks him to alternate looking after her children with Wendy's responsible-minded colleague Jill (Keri Russell). Skeeter hasn't seen the children for many years and doesn't get along with either Jill or the sheltered children, but his easy-goingness loosens them all up in time. Especially once he starts telling his bedtime stories, the children grow fond of him and they soon begin to interrupt him in order to bring in their own ideas about how the stories should go. When elements of the stories turn out to come true in real life, Skeeter tries to manoeuver the bedtime stories into a direction which will make his dream come true after all. The actor, screenwriter and producer Adam Sandler has long been an institution of the American comic cinema. To a large extent this is so, because the audience know what to expect from his movies: fanciful amusement with many a slapstick element. It was just a question of time that he would be in a Disney movie, because the audience expects a similar family-oriented entertainment of Disney, although less slapstick. 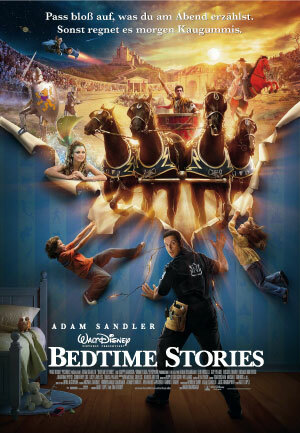 In order for the synthesis of Sandler and Disney to work, and the expectations of both fan communities to be met, a well experienced and attuned team has been put together to make "Bedtime Stories". Director and executive producer Adam Shankman has already made two big Disney live-action films with similar topics: "The Pacifier" and "Bringing Down the House". Furthermore, he was responsible for the remake of "Hairspray" and "The Wedding Planner". Shankman brought with him some of his experienced crew members. Others have worked several times with Adam Sandler: producer Jack Giarraputo, Sandler's partner at Happy Madison Productions, editor Tom Costain, composer Rupert Gregson-Williams and several others were e.g. responsible for "You Don't Mess With the Zohan", "Click" or "50 First Dates". 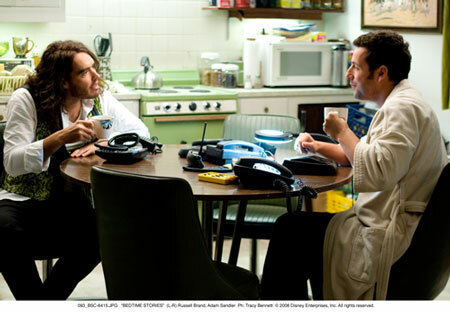 For screenwriter Tim Herlihy this is the eighth Sandler film that he at least co-wrote. You might already conjecture what to expect of "Bedtime Stories": a technically excellent movie. That is one reason why the story, which is told according to the book, offers hardly any surprises and utilizes well known constellations of people and tricks. Unfortunately, some of the digital effects don't look totally real. But then on the other hand, it is the ingenuity of the expert creative heads, which makes up a funny, hearty and round story, especially with the eclectic bedtime stories. Certainly, it is the actors, who carry the film. 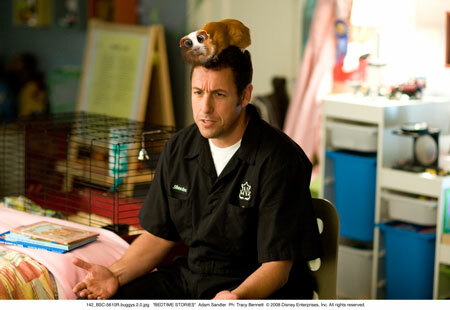 Adam Sandler is, as one expects from him, prematurely funny, but a bit Disney tamed. His opponent is played by Guy Pierce, who is known from as diverse films as "Memento" or the critical drag queen comedy "The Adventures of Priscilla, Queen of the Desert", in which he has already shown himself from his most stubborn side. But it is the pretty unknown, but gorgeous Keri Russell, who shines at the side of Sandler. Although Russel has already been in huge productions like "Misson: Impossible 3", she is best-known for her leading role in the small, but mighty romantic comedy "Waitress". This film has earned her the necessary attention for her to be the leading lady in this year's Disney Christmas movie. If you are looking for buoyant mind candy, you can confidently enjoy "Bedtime Stories" either as a Sandler devotee, a Disney fan or an aficionado of romantic comedies, for this imaginative family film is a spree from first to last.